Plug your headphones into this Sylvania round portable DVD player, and watch your favorite movies without disrupting the flight or car ride. This lightweight player is properly portable with a built-in handle that even little ones can manage. We Have Continually Grown By Providing Quality Deals At Low Prices. 100% Original. 100% Genuine. Quality Tested. Blu-Ray DVD Player. Screen swivels for optimum viewing. Large 14in LCD display for clear 720p picture. We WILL be National Champ by 2035. Show minor signs of use and works like new, includes all accessories needed to function. This SYLVANIA(R) SDVD1332 13.3" Swivel-Screen Portable DVD Player is USED - In Really Good Condition, the item has been tested and works great. may show signs of wear from previous use, such as; scuffs, scrapes, scrathes, etc. Sylvania SRD4900 DVD VCR Combo Player VHS 4 Head Hi-Fi Stereo Tested & Working! Sylvania SRD4900 DVD VCR Combo Player VHS 4 Head Hi-Fi Stereo Tested & Working!. Condition is Used. Shipped with USPS Priority Mail. This unit has been fully tested as working and is ready to use out of the box! Shipped Fast With Priority Mail! Let Me Know If You Have Any Questions! Thank You! 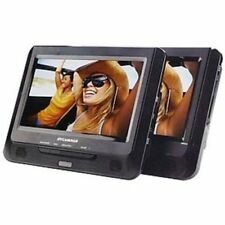 Sylvania SDVD9957 Portable DVD Player with Dual 9" Screen (Black) Headrest mounting strap are not included. AC adapter included. AV Cable included. Item shows heavy signs of use such as scratches, scuffs, small crack or dents. Large 14in LCD display for clear 720p picture. Let us know what the issue is and we will help you as best as we can. Orders are processed within 24-48 Hours. A single cable connection (included) is all that is needed to connect the second screen. A convenient USB input and SD Card Slot enables the display of MPEG4 movies, JPEG and music files. Here we have a Sylvania Portable DVD Player and 7" LCD Display Dual Monitor kit with optional vehicle headrest mount accessories for car travel. We are selling a Sylvania portable dvd player. Model number SDVD9957. Please check with local dealership to make sure item fits before purchase. Thanks. Colored Screen SSC509D 2003. SYLVANIA CRT TV DVD COMBO 9". USED CONDITION WITHA FEW SCUFF MARKS AND SCRATCHES ON THE SURFACE FROM AGE AND USE, OTHERWISE CLEAN. MONITOR AND DVD PLAYER, A ND ALL FRONT BUTTONS WORK (JUST NEED TO TOGGLE A BIT). Item for sale is used, but it is in great condition. DVD player plays movies with no problems, as shown in the pictures. All accessories shown in pictures are included. Trisonic Laser Lens Cleaner for DVD/CD. Trisonic Laser Lens Cleaner for DVD/CD Players - TS-3146B. Introducing the newest model in a collection of the most popular DVD players. The newest Twin/Dual Screen Portable DVD player - Model SDVD9805 does it all. Item for sale its use but is in good condition. Everything has been tested and works as it should. Everything pictured is included. Great quality DVD/VHS player combo from Sylvania. Note that no DVD recording is available - playback only on the DVD portion. Fully play tested on both DVD and VHS. No remote, accessories or printed materials included. Sylvania 9" Dual Screen DVD Player. Model # SDVD9957-D.
You will enjoy the Sylvania portable DVD player with dual 7" wide-screens. It has great picture quality and easy front button displays. One movie two screens, color - black. Includes AV power cable, AC/DC adapter and car cord. Fully tested and functional. Cleaned and reconditioned to perform to original specifications. One slight ding on top. Hardly noticeable. Comes with original manual and av cables. Model: SDVD1037. - Play in Car Movies and Power from the Supplied Car Cord or Take the DVD Unit and Play on the Go With the Integrated Battery. - Install and Mount Easily for in-car Use. iPhone 8 Cases. When you want DVD playback in a compact package, this little workhorse has all you need. The 7'' 16:9 widescreen TFT display is the perfect size for personal viewing on the go. DVD, DVD -R/RW, CD, CD-R/RW, MP3 and JPEG playback let you view and listen to just about anything you can throw at this player. A rechargeable lithium battery gives you all the power you need to free yourself from wires and go on the road. 7" 16:9 widescreen TFT display DVD, DVDR/RW, CD, CD-R/RW, MP3 & JPEG compatible Stereo audio output Built-in stereo speaker Rechargeable lithium battery Black Protect Your Product With a Consumer Priority Service Warranty. Sylvania DVD Player With Built-in Stereo Speakers. Two 7" TFT Color Widescreen Screens. Let us know what the issue is and we will help you as best as we can. Orders are processed within 24-48 Hours. This item is in excellent working order; however it will show visible signs of handling. Portable DVD player (SDVD7014). Up for sale is a Sylvania 7" LCD Screen Portable DVD Player. A/V adapter (3.5mm male-to-RCA female). This disc player supports playback of: DVD Video, DVD-R, DVD-RW, CD, CD-R, and CD-RW discs. This is a DVD VCR recorder player combo. Model is Sanyo DVW-7100. Works great. No cables for TV connection included. It's been said that two is better than one, so check out Sylvania's 7-in. Dual-Screen Portable DVD Player. Features include two color display screens, 3.5mm output, and compatible with most formats. Tested it and it works great as it should, does not come with remote but all buttons on the front work great and does not come with red white and yellow cord. See pictures for details! It looks and functions similar to new. Item is in the original box.